Flyer entiteled, "Concerning General Dietl Street"
Two generations of students at a Bavarian school in Bad Aibling have had a chance to see the exhibition on "The White Rose," the failed student resistance movement. In addition to promoting the exhibition, the school offers information tools about the Nazi era and the Holocaust and schedules regular trips to memorial sites and encounters with eyewitnesses. The school's students are also encouraged to research local history. The Bad Aibling Gymnasium opened in 1974. With more than 1,600 students, it is one of the largest high schools in Bavaria. In 1980, participants in the advanced-placement art course were assigned to enliven and decorate the school's assembly hall (the "heart of our school"), using the slogan "Heroes." 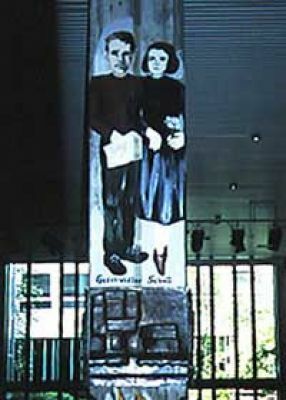 The students placed a life-size drawing of the Scholl siblings on the high central front pillar, so that every student, teacher, and visitor was greeted by Hans and Sophie Scholl upon entering the school [see Visuals]. For this reason, it was almost imperative for the question of civil courage and the history of National Socialism to repeatedly take special and clear priorities in our schoolwork. 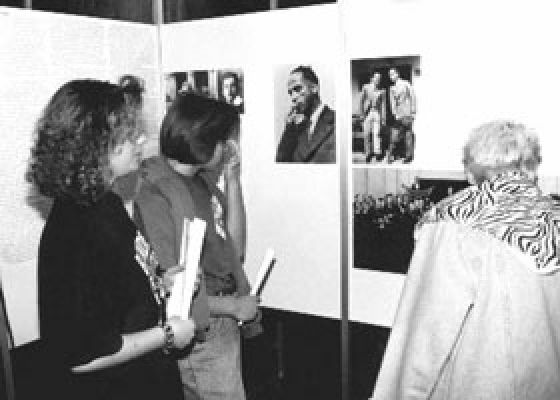 The students and teachers of the Bad Aibling Gymnasium continuously deal with the subjects of National Socialism and the Holocaust by making annual trips to the Dachau memorial, by participating in teaching projects and specialized work, through student exchange programs with Israel, through dialogue with eyewitnesses, and by means of events and exhibitions. For many years, annual trips to the Dachau memorial have been among the established components of our school's history curriculum. With their history teachers, the 10th grade and students in the second semester of the 9th grade visit the Dachau concentration camp memorial in connection with their study of National Socialism. The excursion leaves a deep impression on many of the students. By touring the museum's exhibits, viewing the documentary film "Dachau Concentration Camp," and walking through the camp terrain with its roll call square, reconstructed prisoner barracks and crematoria, the young people can experience the camp rather than just hear about it through classroom instruction. Historical events, which remain incomprehensible and relatively ineffective when they appear in textbook balance sheets and abstract numbers because they strain the imagination, come to life here, at the actual place where they occurred, especially through documented individual accounts. Meeting with former prisoners makes the greatest impression. The feelings of dismay that set in during such encounters always lead to stronger and more serious discussions later in the classroom. For this reason, the school has repeatedly invited survivors for discussions with students in grades 9 through 12. In May 1998, Wolfgang F. Robinow told of his experiences. He emigrated to the United States in 1938 at the age of 20 and returned to Europe as a U.S. Army officer in 1945, participating in the liberation of Dachau and the occupation of Munich. After the war, he served as an investigator for war crimes and headed an internment camp [see Reference: Contact information]. Max Mannheimer, chairman of the Dachau prisoners' committee, is a regular guest at our school. He last spoke in 1994 during the school's literature days about his experiences in three concentration camps [see Audio/Video]. The personal contacts formed by visiting the Dachau memorial and meeting survivors proved decisive for a group of students and teachers who worked on the organization and implementation of the memorial event for the 50th anniversary of Dachau's liberation (April 30, 1945). We also use anniversaries as incentives to hold memorial events in our school, such as the 50th anniversary of the Wannsee Conference on January 20, 1992, or to participate in outside commemorative events with individual student groups, such as the 75th birthday of Sophie Scholl at the University of Munich. When non-school events that can supplement classroom instruction take place nearby the school, they are eagerly incorporated into the curriculum by our subject specialists. Examples are participation in city tours on the subject "National Socialism and Resistance in Munich" and a visit to the much-debated "Wehrmachtausstellung" (an exhibition about the crimes of the German Army during World War II) by the students enrolled in basic and advanced history courses in March 1997. In selecting topics for written assignments, our students have also revealed their interest in the subjects of National Socialism and the Holocaust. They have often participated in competitions and have received prizes for their submissions (see the following list of Facharbeiten [one-year research projects]). In February 1989, the project group "Politics and Contemporary History" won one of the major prizes in the 1988 student competition for political education with an essay about Kristallnacht. The competition was sponsored by the Bundeszentrale für politische Bildung [Federal Office for Political Education]. In addition to a description of the sequence of events during that pogrom, the submission provided the results of research the project group had done on the anti-Jewish riots in Rosenheim, the students' hometown. Even without participating in competitions, some projects have stirred public interest. In the spring of 1991, an article by Anke Dörrzapf about the subcamp Stephanskirchen was published in the student newspaper "Aiblizissimus." In her Facharbeit, Dörrzapf had exhibited expert knowledge of this Dachau subcamp located between Rosenheim and Bad Aibling. Her article in the student newspaper was later discussed in the "Abendzeitung" ["Evening Journal"] on July 22, 1991 [see Documents]. It was also reprinted in the magazine of the Dachau survivors' association (no. 11, 1991) and, in 1992, in the first issue of "Geschichte quer - Zeitschrift der bayerischen Geschichtswerkstätten" ["Cutting through History: Magazine of the Bavarian History Workshops"]. In almost all Bavarian schools, students are required in their last year before Abitur [final examinations] to complete a Facharbeit, a research project in their major fields that requires nearly one year of study and inquiry, in order to get experience in specialized research. The students receive suggested topics from their teachers, but they are allowed to submit topics of their own interest. During the past two decades, many interesting research projects have developed in the advanced history course and the results are partly incorporated in subsequent classes. 1981 The development of the National Socialist Party: How do you view right-wing radicalism today? 1981 Examine Social Darwinist influences in Adolf Hitler's "Mein Kampf." Do such movements still exist today? 1983 Do historians also acknowledge Hitler's positive accomplishments? 1998 Denazification in Germany, with local focus on Bad Aibling in the American occupied zone. The exhibition "The White Rose" and cooperation with the White Rose Foundation have a long tradition at our school. Since July 1986, the survivor Franz Josef Müller, a member of the White Rose, has held discussions about political resistance with tenth-grade students. This contact resulted from a history teacher's initiative and led to a series of further collaborations. Thus, from June 8-23, 1988, we presented the exhibition "The White Rose: Portrait of a Munich Group" for the first time in the school's assembly hall. The exhibition was opened by Barbara Distel, director of the Dachau memorial. Students from the tenth to twelfth grades took part in the exhibition opening. "After the opening ceremonies, the exhibition was very crowded. If one followed the exhibition in sequence, after the introductory text panel one came to the long list of the members of the 'White Rose' who were arrested. Here, one could learn the dates of arrests, trials, sentences, and whether the resister was executed or freed by the Allies. 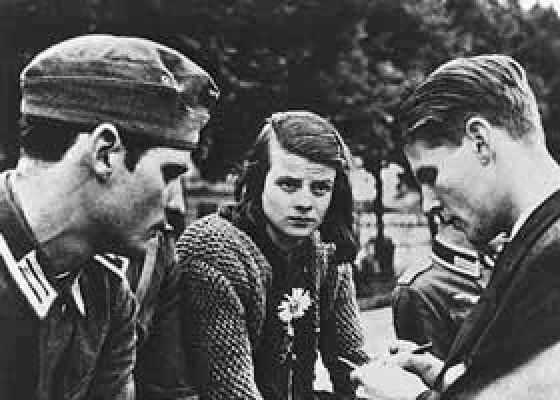 The six main defendants of this group - Hans and Sophie Scholl, Christoph Probst, Willi Graf, Alexander Schmorell, and Professor Kurt Huber - were represented with a biography and photograph. The students' possessions (their notebooks, songbooks, etc.) as well as books on the "White Rose" (the latter available for purchase) were exhibited in two glass cases. But the goals and beliefs of this resistance group could be learned above all from their leaflets (Schülerzeitung Aiblizissimus, Sommer 1988, p. 13) [see Documents]. In 1996, the work, along with the large exhibition "The White Rose: The Student Resistance Against Hitler, Munich 1942-43," designed by Otl Aicher and Franz Josef Müller, was a special focus of our schoolwork on National Socialism. The updated exhibition contained 70 photographic and text panels shielded in plastic. From June 6 to.July 2, 1996, Sophie and Hans Scholl, as pictures on the entrance pillar to the school's assembly hall, led visitors into the walk through the text and photographic panels about student resistance against Hitler [see Visuals]. The exhibition was supplemented by a series of additional projects, which can only briefly be listed here. a) Class trip to Munich to visit the places where these events occurred. b) b) City tour on "National Socialism and Resistance in Munich"
The effect of the exhibition, "The White Rose: The Student Resistance Against Hitler, Munich 1942-43," and its accompanying programs in regard to confronting National Socialism and the demand for civil courage can also be shown to some degree by the flyer "Concerning General Dietl Street," distributed in front of our school on June 15, 1996 [see Documents]. 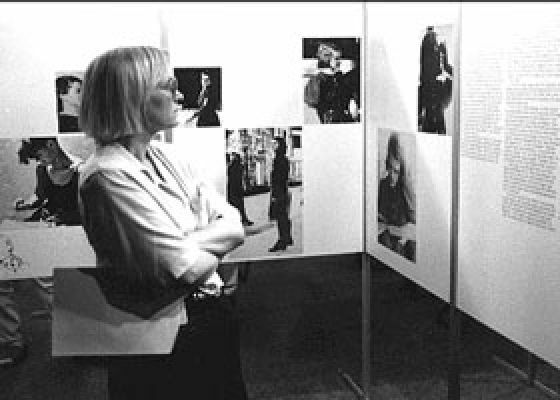 Student, teacher, and parent reactions to the exhibition show unambiguously that the legacies of Sophie and Hans Scholl have been taken seriously and that heroes can have an effect. Thus, the names of members of the anti-Hitler resistance appear among those proposed by student representatives for the renaming of our school in honor of its 25th anniversary in 1999.